I recently shared my “7 days in black and white” challenge pictures on Facebook. I wanted to put all seven together and showcase part of my life. So here it is, 7 days, black and white, no people, no pets, no explanation. I like video games. It’s fun to get lost in an adventure for hours at a time, were the only care is the world ending in a ball of fire and brimstone and you have to beat the super bad or everyone will die. I’ve been playing video games since the Atari came out (well, we had the third version anyway). I struggled through the first Zelda game and raged quit Simon’s Quest. I’ve been a long supporter of Square-Enix and have played just about every Final Fantasy game there is. When they started producing Kingdom Hearts, my little nerd heart just about exploded because now I could play videos and explore Disney realms. It was the best of my geekdoms all in one. I admit that I came to the Bioware fold late. The first time I heard about the company was when they released the MMO Star Wars: The Old Republic (SWTOR). I was never much of a computer gamer. My gaming system of choice was Nintendo and later Playstation. I played a few dungeon crawler RPGs on other people’s computers, but I never owned a gaming PC (mostly because my computer loyalties lie with Apple). However, I heard people talking about this SWTOR game and they really liked. I was intrigued enough to go out and purchase not only a copy of the game, but the gaming PC that I needed in order to play the game. That’s how it all started. I created my character (a smuggler) and began my galaxy wide adventure first hunting down my ship and then helping the Republic beat the Sith Empire. Along the way I was able to meet companions, chose various dialogue options, and build relationships with both PCs and NPCs in the game. There’s even romance options so you can flirt with your companions in hopes that they will love you. Once I finished the smuggler story line, I went back for more. I have since completed all 8 storylines in the game (cause what else am I going to do on a Saturday night). Then I learned there was more. Turns out, Bioware has been making games like SWTOR for a while now. I discovered that I was Revan, a once Jedi, once Sith, Jedi again force user who could either save or destroy the galaxy in Star Wars: Knights of the Old Republic. I was the Grey Warden who defeated the Darkspawn and lived to tell about it in Dragon Age: Origins. I was Hawke, a girl fleeing from her war torn land into a city of political intrigue and helped spawn the mages’ rebellion against the Templars in Dragon Age 2. I was the Inquisitor in the final Dragon Age game and sealed the Breach, saving my world from unspeakable horrors. And most recently, I was Commander Shepard, who saved the entire galaxy from the Reapers, a race that wanted to wipe the slate clear of life and let it start all over again in the Mass Effect games. I’ve played rich RPG games before. The Final Fantasy games are all great games with wonderfully engaging story lines (even if they are a little weird sometimes). The later Legend of Zelda games follow Link some a detailed world where you are responsible for saving Zelda. The games I have played in the past all have good plots, solid game play, and are really fun. But there are not Bioware fun. Bioware doesn’t just guide you through the story. You are a part of the story. All of their games have a level of interaction that I had not seem in a console game before. You get to make decisions that (kind of) effect the outcome of the game. You get to interact with your companions by talking to them, giving them gifts, and influencing their actions. And your companions opinions of you matter (sort of). I found myself on more than one occasion making a decision because I knew that my companion would want me to make that decision. These games are so much more immersive than any other game I had experienced. I recently started playing the new chapters in SWTOR and it’s super fun. More than being fun though, I want to go back and replay it with my other characters to see how the story changes based on the decisions I make. Do I get the same scene if my dark side character decides to shoot down the transport? How about if my Jedi saves that person instead? That’s the great thing about Bioware games: they are very replayable because you can make different decisions and see the different outcomes. Maybe the differences are small, but it makes the game more personable. I am (mostly) good with my characters so it’s enjoyable to go back through and see what changed if I make the dark side decision instead. Mass Effect Andromeda comes out March 2017. I am super excited for this game. I haven’t been super excited for a game since Kingdom Hearts II came out (although I am super excited for KH III, too). I’m looking forward to another adventure with rich stories, unforgettable characters, and vast worlds. It’s no secret that I’m a Disneyland (DL) fanatic. I go several times a year because I can. I don’t get sick of it and I don’t get bored of it. It is my sportsball and I wrote all about that here. Recently, I got to visit Walt Disney World (WDW) for a family Christmas trip, and boy-howdy was it different. I have a lot of friends who swear that WDW is so much better than DL, but, after visiting WDW as an adult, I’m going to have to disagree. I actually like DL better. It might be because I’ve spent so much more time there that I have a more personal connection to DL. It might be the cast members or the people. It might be the cleanliness of the parks. Here’s some of the observations that I made while in WDW. Let’s start with the good. WDW is huge. There are four main parks, three water parks, Disney Springs (formally Downtown Disney), and 27 Disney resorts. We were there for 7 days and probably did a quarter of the things there are to do. We didn’t even fit in all of the rides at the parks, although we did try. There are so many things to do at WDW compared to DL. I could have easily spent those 7 days just in one or two parks in order to see all the attractions, parades, shows, and eat all the food. I never felt bored in WDW despite the amount of time we spent there. I think if we spent 7 days in DL, we would have been bored by the end of the trip. Yes, there are lots of things to do in DL as well, but not 7 consecutive days worth. WDW definitely wins on the amount of things there are to occupy your time with. Ok, time to get into the bad. WDW is dirty. I’m sorry, but it has to be said. I’m not sure why, but there was trash everywhere! We were in line for the Seven Dwarves Mine Train ride at 7:05am, right when the park opened, and there was already a pile of trash in the line que. Cups and wrappers and water bottles littered the areas around the queues for all the rides. I had to step around multiple gum-landmines in all of the parks. Trash cans were just as prevalent in the Magic Kingdom and the other parks in WDW as they are in DL, but for some reason, people seemed less inclined to use them. And the cleaning staff seemed to have a difficult time keeping up with the litter-bugs. DL, on the other hand, always seems clean. I have actively watched their cleaning staff scoop trash as people drop it. The line queues are monitored better and trash is dealt with swiftly. DL wins on the cleanliness of the parks. Since we started talking about cast members on trash duty, let’s continue that train of thought. The cast members at WDW are kind of rude. Many seem like they don’t want to be there. I overheard several cast members complain about their schedules and days off. My sister listened for many moments to two women in the France area of the World Showcase complain about their paychecks before they gave her any attention (I don’t think they realized that my sister speaks French!). I watched a cast member literally snap her fingers at a group because they weren’t moving fast enough in the line. I had a cast member yell “Ma’am” at me over and over again because, yes, I had crossed a rope barrier to take a picture of some lights. I realize I wasn’t supposed to cross the barrier, but yelling “Ma’am, ma’am, ma’am” at me over and over again wasn’t working. I honestly didn’t realize she was talking to me. It wasn’t until a family member called my name that I realized the cast member was talking to me. I’ve never had that happen to me at DL. Even if I’m in a place I’m not supposed to be, the cast member is polite in asking me to follow the rules. While I have heard some complaints from cast members in DL, it is few. It seemed like every person who was working at WDW hated their jobs. The wait staff at the restaurants were pleasant, but most of the store clerks and quick service staff were at best indifferent and at worst flat out rude to customers. There also seemed to be a lot of new people training at WDW. There were several times that cast members seems flustered or overwhelmed by what was happening around them. One notable occurrence happened at Hollywood Studios when we boarded Star Tours. The cast member responsible for placing people in rows was having all sorts of trouble placing people correctly. So much so, that she was using a cheat card that showed her the number of seats per row. I have never seen a card like that in DL and Star Tours is my favorite ride. All in all, I give major points to the cast members at DL. They are always polite and rarely flustered. Maybe there was a lot of season help at WDW, but I was not impressed by their staff. Not all of the problems at WDW were caused by cast members. The people are WDW were just as much at fault. There is a different clientele between WDW and DL and it’s not something I can put my finger on. It was just a different vibe from the people in the park. For starters, rarely do I see people just dump their trash on the ground in DL, but, as mentioned, trash was a big problem in all of the parks in WDW. More than that, the people in WDW just seems more pushy and less likely to help out. I watched several groups just push past others to get into lines. One group cut me off in line, separating me from my dad and my sister. When a member of their party tried to stop me from squeezing past them, I had to mention that they cut me off from the rest of my party. Even then, they seemed annoyed that I wanted to get past them to ride with my family. One of the people in my group was walking down the street and an older couple refused to unclasp their hands so he could walk through them. They literally let him walk straight into their joined hands and kept walking without saying or doing anything. He could have walked around them, true, but for anyone who hasn’t been to WDW during the Christmas holiday, the streets are packed with people. It’s difficult to walk around because there are people on all sides of you. The people at DL seem more friendly, polite, and willing to let you meet up with your party in line without giving you attitude. Although, I will give people in WDW props from not using their flash on rides. That is a much bigger problem in DL. Let’s end on a positive note. WDW has some of the best food I’ve ever had in a Disney park. Cream cheese filled pretzels aside (and if you haven’t had one of those, you are missing out, my friend) WDW had amazing selections of food. We didn’t have a bad meal there (except at the hotel). From Yak and Yeti at the Animal Kingdom to the Crystal Palace at the Magic Kingdom to the many offerings in the World Showcase at Epcot, it was all good. The dining plan also allowed us to eat larger than usual portions, so we only needed to eat twice a day with some snacks in between. The sampling of food was fantastic, though. 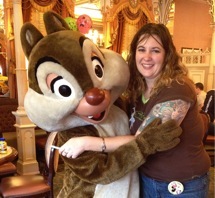 DL has some good food as well, but the sheer range of foods you could eat at WDW was a treat. We had French one night and Moroccan the next with some Norway in between for lunch. There was seafood and grilled food and healthy food and not so healthy food (I’m looking at you, pastries). We definitely did not go hungry. Our WDW trip was super fun and I am definitely going back in the next few years, but I still think DL will always be the special park in my heart. I kind of find this funny and amusing. I want to ask these people “Do you get sick of (enter sport here)?” Or ” you’re listening to that song again?”. Because that’s how I feel about Disneyland. This is my happy place and my passion and my relaxation. If you’re not sick of watching football every week, why do I have to be sick of going to Disneyland every month? “Welcome to Disneyland!” This is my fan chant. I get tingles and tight in the chest and short of breath when I here this. I walk through that turn style and am transpired into my own heaven, where my brain stops over thinking everything and I just am. There are very few places where I can just be. Disneyland is one of them. I walk down mainstreet. I can’t describe the smell: churros and baking and Disney. It’s sugar and spice and everything nice. The music, the shops, it all adds to the ambiance. It doesn’t matter that there are a million people. It doesn’t matter that I wait in line for hours for my favorite ride. It’s a magically place where I feel at peace. Please stop asking if I’m sick of Disneyland. I’ve been an annual pass holder for years and I’m not sick of it yet. It’s the happiest place on earth. It’s my happiest place on earth. It’s no secret that I love Disney and everything the mouse has to offer. I’ve seen every animated movie multiple times and can still sing along to with all the songs. I have a “shrine” in my office – the walls are littered with prints, posters, collector pins, stuffed animals, toys, and figurines. The only thing I’m missing is a Disney tattoo and I’m working on that. The crown on my Disney obsession came in August of 2011 when I went to Disneyland with a group of friends, all of whom had an annual pass. They knew of my Disney craze and decided to gift me with my very own annual pass. And the tradition of going to Disneyland, a place I have all but worshiped since I was 5, monthly became a reality. 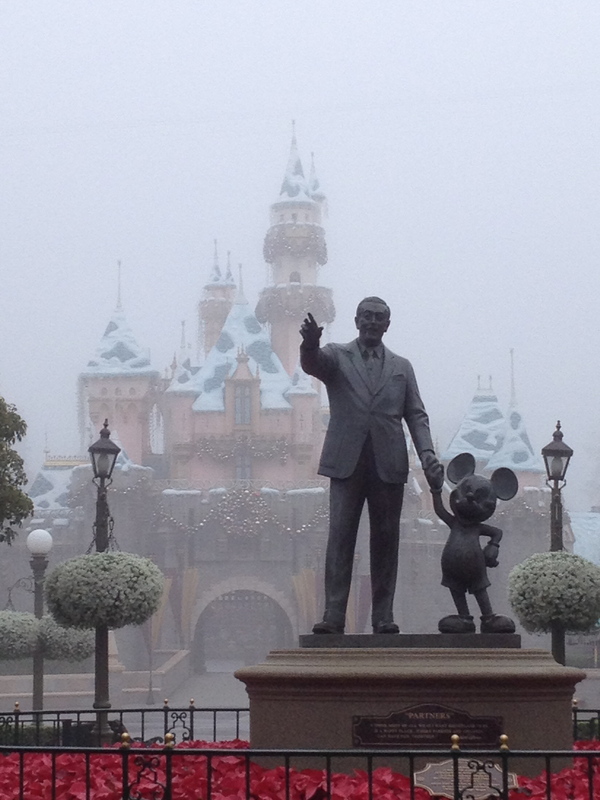 Next time you go to Disneyland and you’re walking up Main Street, U.S.A, look around you. I mean, really look. The buildings are all different, down to the material they are made out of. Walt wanted it to look like a small town main street and he wanted it to be realistic. There are store names written over some of the second story windows. If you take a trip back to the lockers, there are sounds of pianos playing and a man visiting the dentist. There’s even a small pouch with a rocking chair (prime parade watching area if you can get it). Nothing is out of place. Head over to Adventure Land, and you’ll find the same thing. There are cracks in the bazar walls, making it look older. The open air fruit stand has packing crates and faded paint. Even the rides pay attention to detail. Let’s jump on Indiana Jones and the Temple of Doom. The que line has old machines and generators running in front of the temple. The status out front are of giant cobras and snakes. The rickety bridge leads you up to the entrance, which take you down through a network of caves (watch out for bats!) and booby traps (don’t step on the wrong brick!) until you come into the temple itself. There, you see vast murals painted on the temple ceiling with scaffolding for the archeologist to use. Nothing is left out. If you look really close, you can even spot a hidden Mickey or two. Details matter and Disney knows it. Somethings it’s the smallest detail that you didn’t think about that ruins the experience, no matter what that experience is. It’s a lesson that I’m applying to my own work and life. I often find in lesson planning that there is a small detail I did not think of that makes the work that much harder for my students and for me. Disney has a special name for all employees: cast members. You are not an employee of Disneyland, you are a cast member. It makes a little difference. As a cast member, you are supposed to be on stage, ready to perform for the audience, aka the customers. Disney cast members, for the most part, always seem happy to be there. They smile, they wave, they chat politely with you. You rarely hear cast members complaining about their jobs while they are “on stage”. And the few times I have, it’s honestly ruined a little of the magic for me. I have openly complained to cast members when I hear them ragging on their jobs. I understand that all jobs have their bad side (I’m a teacher, after all), but I see no reason to complain about it in front of the very people who are helping to pay your wages. But that’s not the point. The point is most cast members seem to really enjoy their jobs. It’s an important lesson to be learned. There are lots of things about jobs that annoy and bother people, but I think people should at least act happy to be there while they are “on stage”. Complain behind the scenes all you want, but show the customers a smile. It doesn’t matter how many times I’ve been on Space Mountain, I still scream every time. It’s fun to yell out loud as the roller coaster races through the dark. I do the same for all the roller coasters at Disneyland. Actually, I do the same for most of the rides at Disneyland (except Small World, I just sing along then). To me, Disneyland is a place to let loose, to sing along, to dance in the streets, and to scream like I mean it. I’m not worried about what other people think because I don’t really care what other people think. I’m having fun and that’s all that matters. It’s harder for me to live like in this every day life. I have to care a little about what people think about me (naming my bosses). It’s also helpful as a teacher to have your students like you. It’s not required, but it makes the classroom run a little smoother. That doesn’t mean that I can’t be “me” though. I can tell bad puns and be silly and enjoy life rather than just going through the motions. Not only do I scream like I mean it, I laugh like I mean, cry like I mean, love like I mean it. Anyone who knows me knows that I’m a scientific skeptic. Basically, I don’t take much on faith, I want to know the science behind it. I don’t believe in ghosts, but that doesn’t mean I can’t enjoy The Haunted Mansion. I know the anatomy of insects, yet I still love Bug’s Land (probably my favorite of all the areas in Disneyland). Just because I like science and want to understand how the world works doesn’t mean that I can’t also enjoy the magic of Disneyland. That’s what Disneyland is all about! I wave and smile and love getting my pictures with the characters because, when they are in that costume, they are the characters from my childhood. I’m going to a character breakfast where I will be the youngest person in our party of 4. And I’m super excited about it! I can never understand the people who can’t immerse themselves in the story. It’s the story that makes Disneyland the happiest place on Earth and my own personal laughing place. And I’m excited that I get to keep going back.